Hyponychium is the epithelium which is present just below the free edge of nail plate of nail. It is the particular thickened portion of epithelium. The proximal border of hyponychium have an immediate distal end connected to the distal end of nail bed. The point where distal end of nail bed and distal end of nail plate joins is named as onychodermal. It is a normal physiology of nail that hyponychium extends whenever nail grows and due to this extension, hyponychium is termed as extended hyponychium. It is not a pathological condition, but considered as a part of nail anatomy. Hyponychium is the component of nail anatomy, some changes in its shape and morphology may cause problems. Hyponychium may attach closely and firmly to nail edge causing problems. This may occur due to 3 main reasons systemic lupus erythematosus, scleroderma and repetitive use of acrylic nails. Contrary to this condition, hyponychium may get apart from nails and is termed as onycholysis. It may occur due to psoriasis, frequent use of artificial nails, yellow nail syndrome and bacterial infections. Some environmental factors also contribute to onycholysis. Extended hyponychium is another problem if it extends beyond limit. All these problems show distinctive symptoms. In hyponychium overgrowth, hyponychium develops beyond limit and attach to nails firmly. This may occur due to poor hygienic conditions and environmental factors. Hyponychium overgrowth creates problems regarding nail cutting. Because overgrowth of hyponychium makes nail cutting difficult. Some dermatological conditions like psoriasis, scaling, eczema and erythroderma may make skin dry and complicate the pre-existing hyponychium overgrowth. 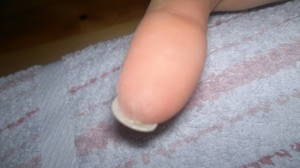 People reported that hyponychium overgrowth do not occur on all fingernails. People say that they feel fuller finger buds with overgrowth of hyponychium. Hyponychium overgrowth do not cause any severe problems and can be treated easily with proper hygiene. Extended hyponychium is a condition in which hyponychium extends with growth of nails. People with this problem have to cut down their nails and keep them shorter. If people are fond of having longer nails, then they have to follow some tips. As people with extended hyponychium have to apply cuticle oil on it to make it soft. When it becomes soft, it can easily be pressed down and make it on place. It will help a lot. Care is required because a minor cut or sharp touch of stick may cause pain and infections. For this purpose, a specific orange stick is used. All the problems related to hyponychium are not actually problems. People are okay with extended hyponychium and overgrowth of hyponychium and do not require treatment. Some care tips should be followed to manage it. Nail care tools are available in market. Cuticle oil is recommended for extended hyponychium to make it soft and push back to its place. But if there is any pathological condition behind these, like psoriasis, fungal infection, scaling, eczema and last but not least erythroderma, then treatment is necessary. Treatment is selected according to the leading cause behind extended and overgrowth hyponychium.